The soon to be six year-long investigation into the case against Barack H Obama and his use of a stolen social security number which belongs to a 120 year old deceased individual by the name of Harry Bounel has taken a new course today. The information obtained was on a Mr. Harry Bounel who was born in Russia in 1890 and living in the Bronx, NY as of the 1940 Census. 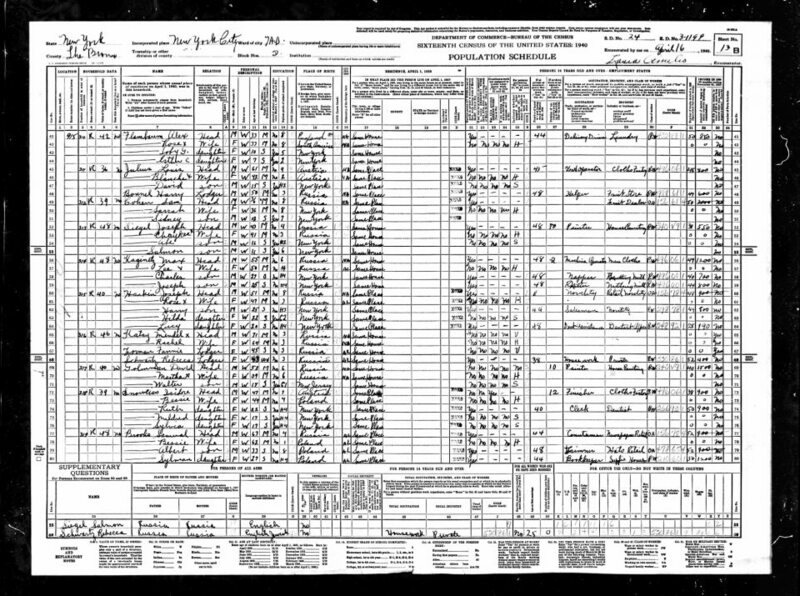 1940 Census listing Mr. Harry Bounel on line 48. 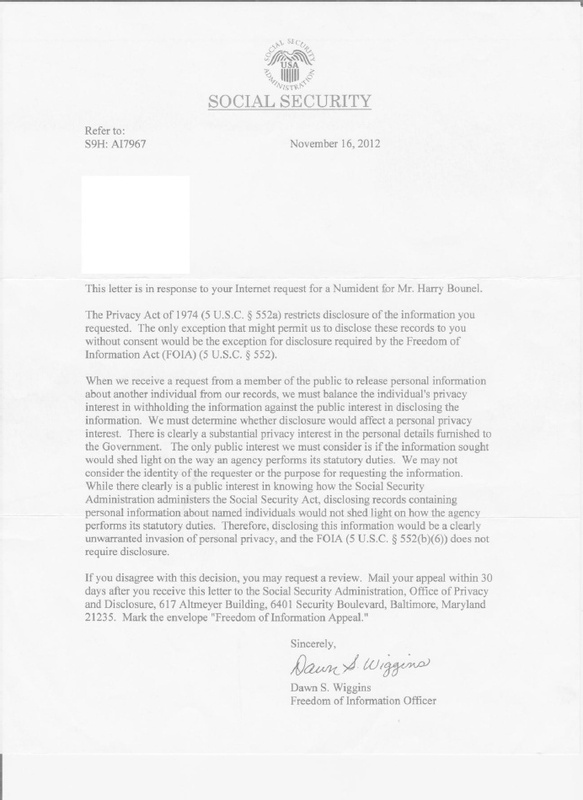 As per a November 16, 2012 FOIA noted below which clearly proves that the social security number, 042-68-4425 absconded by Obama does not belong to him but in fact belongs to Mr. Harry Bounel. When the FOIA was requested it was done using the “SS-5” request form using the 120 year old rule which excludes privacy concerns for information requested for information on a deceased individual’s “SS-5” documentation who would over 120 years of age at time of request. It was completed using the name of Harry Bounel, SSN 042-68-4425, and the DOB – 1890. My previous article, “https://theobamahustle.wordpress.com/?s=three+strikes” goes into great detail on how the evidence has mounted against Obama and his fraudulent activities concerning his absconded social security number. “Judge Hollander in Maryland gives Attorney Orly Taitz 21 days to file a second amended complaint and add allegations in regards to an improper withholding by the Social Security Administration of records of Harry Bounel, whose Social security number is being illegally used by Barack Obama. 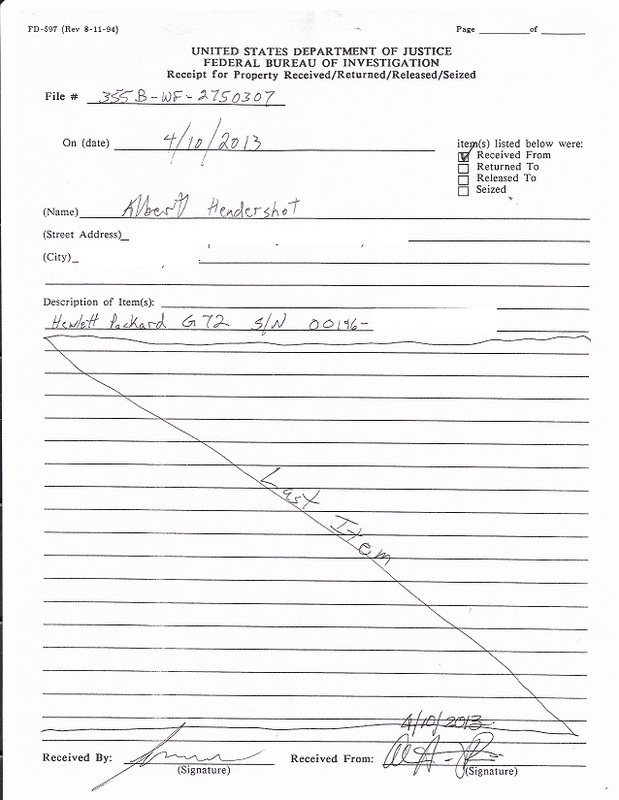 When Taitz filed the complaint, SSA did not respond at all. After the law suit was filed, SSA responded by fraudulently claiming that the records were not found. Taitz responded that this is a fraudulent assertion, since the records were found before and denied to another petitioner due to privacy concerns, however Social Security has no right to claim privacy as according to their own 120 year rule they have a duty to release the records. The judge stated that the plaintiff Taitz might be correct, however at this time she cannot rule in her favor as her original complaint was filed before SSA responded, so the judge gave Taitz an opportunity to re-file a second amended complaint and add new allegations, stating the SSA responded but improperly hidden the records . Each and every one of Obama’s relatives have all had social security numbers of their own even though they have all been documented as being in the United States illegally. On April 10, 2013 the FBI showed up at my front door. When I answered the door they told me who they were and that they wanted to speak to me about activities with / about the exposed website that was posting information about Muller, Holder, and Obama. Well, obviously, I have nothing to hide so I gave them my computer. I was also handcuffed while they were talking to me. Two days later I get a phone call from the FBI telling me that I am not in trouble and that I have nothing to worry about in connection to my activities with others and what I am writing about in my blog www.theobamahustle.wordpress.com On the 12th I go by the FBI office with a witness, just in case, to pick up my property and again they tell me, “that I am not in trouble and that I have nothing to worry about in connection to my activities with others and what I am writing about in my blog”. When they were at my house they, the FBI secured my personal information as well such as my SSN and other personal information. I have no doubt they investigated me out thoroughly and also investigated at what my activities have been in connection to the Obama fraud evidence and others as well. Later on in the day I received some phone calls from people that I have been working with on the Obama issue. They, the people that I spoke with said that my activities with the “Cold Case Posse” and my postings on Obama in The Obama Hustle along with the evidence that I have collected on him and his family probably had something to do with my visit from the FBI. I have not heard of any others being visited by the Feds as it pertains to the exposed website. In my discussions on Friday we came to the conclusion that this is very interesting in that there must be some people that are worried over what information might be available against the anointed and protected one from his lies being exposed. I will not be deterred. I will not be harassed. I am not afraid. I will give my life for my country and for what I believe in. “FREEDOM”. We are in a fight for our nation from an individual and others who want to destroy the United States of America and transform this great nation into a melting pot and Socialistic paradise for radicals and illegal aliens so they can stay in power. GOD Bless America and those patriots in this fight against the evil ones that want to enslave us, kill GOD, and kill our babies. 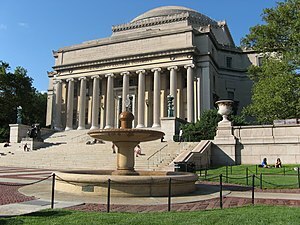 It is well known that Obama supposedly attended Columbia University for his supposed last year of undergraduate studies. However, the name used for the financial aid that he reportedly received has been an unanswered question until now. There can be no denying that Obama used a different name to obtain monies reserved for foreign students to pay for his tuition to Columbia University back in the 80’s when was supposedly an undergraduate student. In October of 2011 I was conducting one of my daily database searches for any information relating to Obama and his alter identities such as his other last name of Soetoro. 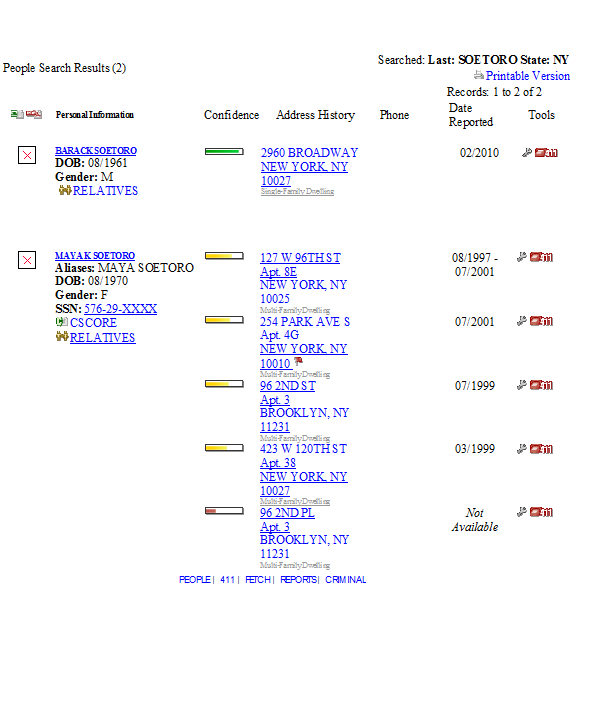 I discovered an anomaly using the database information that was pulled when I used the last name of Soetoro in and for the state of New York. The following exhibits are the items that were pulled when the searches were completed. 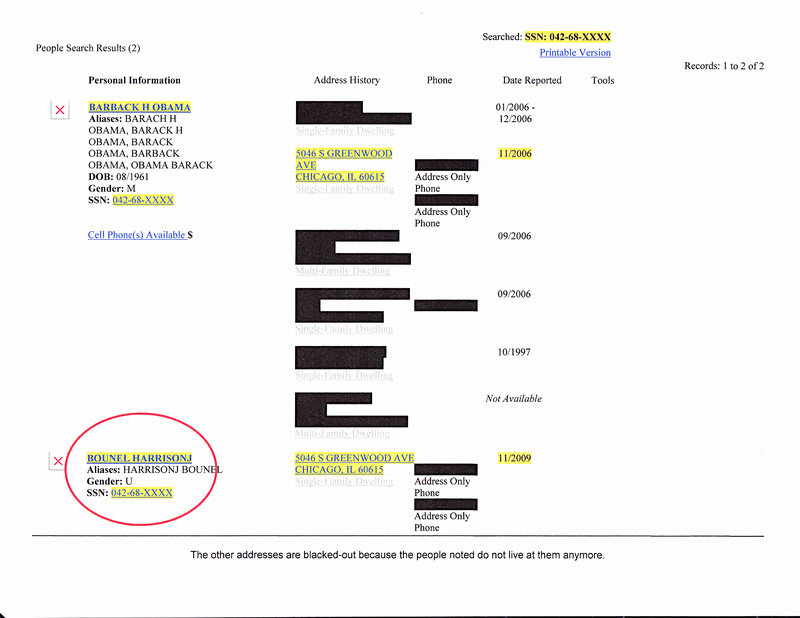 Exhibit 1 shows the database pull that details two names, one for a Barack Soetoro and the other is for Barack’s sister Maya K Soetoro. Please note the name of the first person in this particular search. The first name is Barack and the last name is Soetoro. This is the name that “Obama” was using when he was a child living in Indonesia. Now, when he returned to the United States and began living in HI he started using the name of Obama, but secretly he was using his legal last name of Soetoro as of his tenure as a student at Columbia University. 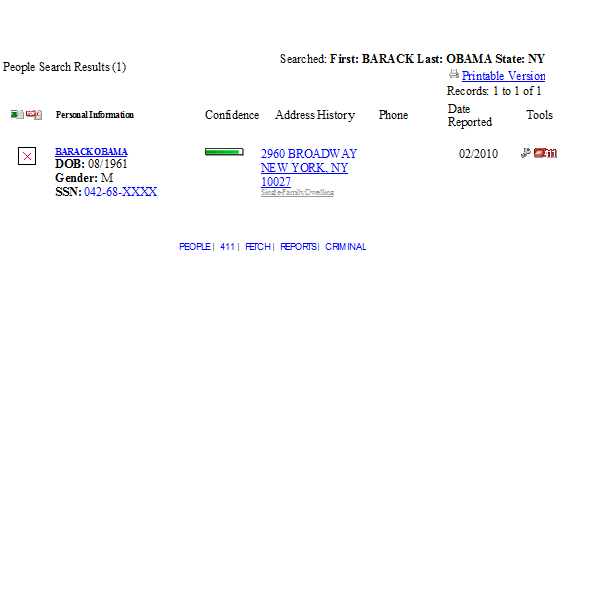 Exhibit 2 details the search that I completed using Barack Obama’s name in and for the state of NY. The significance of these two searches is that the result shown in (exhibit 1) was the first search completed which lead me to complete the second search detailed in (exhibit 2) which I completed using Obama individually as the search for the state of NY. The information that pulled was Barack Obama linked to the same address as Barack Soetoro. This address is 2960 Broadway, New York, NY 10027. Now, why is this significant? Here is why this information is so significant. Exhibit 3 below is in the from of a PDF file that I downloaded from Columbia University and it details the process for permanent residents wishing to obtain a social security number through Columbia University. In order to obtain funding, permanent residents must obtain a number to apply for financial aid and or seek employment. Now it is not known whether or not Obama had a job or not while attending Columbia University, but documentation was required for financial aide. So did he Soetoro / Obama obtain a SSN using the alias of Barack Soetoro through the International Scholars and Students Office? Columbia would be eligible for J-1 status. What student status and what forms did Barack Soetoro use at Columbia University? In February of 2010, someone had to have accessed the records of Barack Soretoro at Columbia University and altered them therefore creating the imputed data creating the file for Barack Obama on the same day of February 2010 so as to produce the results obtained by me as of October of 2011. I challenge anyone to disprove my findings. We will have to open the records and examine them completely so as to disprove my findings and get to the truth once and for all. 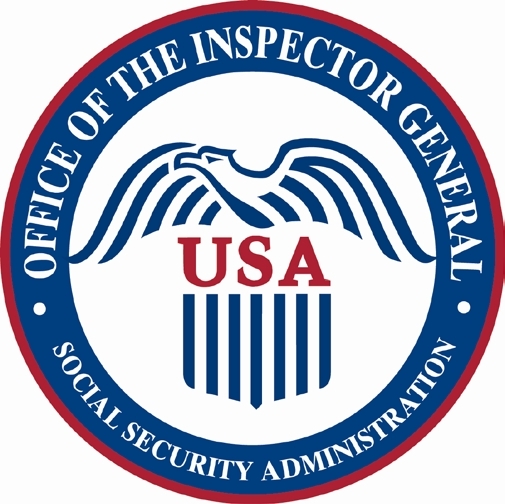 The problem of using the social security number as an identifier is the fact that a social security card contains no biometric identifiers of any sort, making it essentially impossible to tell whether a person using a certain SSN is truly the person to whom it was issued without relying on some other means of documentation (which may itself have been falsely procured through use of a fraudulent SSN). SSN-042-68-4425 is the number that Obama has been using since 1979 when he was 18 yrs old. A number that he acquired from CT while living in HI? Below is the stolen SSN number that Obama is using and it has been broken down so we can understand how a social security number derived. At the inception of the program, all SSNs were assigned and cards issued based solely on information provided by the applicant. However, in the 1970s, SSA began requiring proof of age, identity, and citizenship. In-person interviews are required for individuals aged 18 or older applying for original or new SSNs. An individual signing the SS-5 on behalf of another (for example, a parent for his or her child) must establish his or her own identity. In 1979 when Obama was 18 yrs old and supposedly ran off to college for the first time, well he needed an identifier for his supposed identity. It is now a known fact that Obama has never had a legitimate long form birth certificate to prove his identity. Now let us reason this, if one does not have a valid birth certificate of any kind then there is one document that is virtually impossible to acquire with out a valid birth certificate and that is a social security card that is used as an identifier in our country. Well, without a birth certificate to get a social security number he had to get one somehow. It is obvious that Obama had to have a SSN by the time he entered Occidental College in 1979 because he sure did not have any other form of legal documentation that he would have had to produce to enroll at Occidental College, or Columbia University, or Harvard Law School. 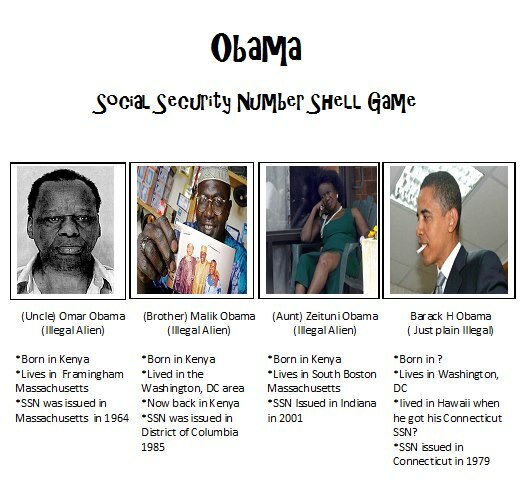 So in keeping with the above information now let us look at what has been discovered as it pertains to Harry Bounel’s and Barack H Obama’s social security number. In May of 2011 I completed my first database pull for SSN 042-68-4425 and here was the result. Note the name at the top. 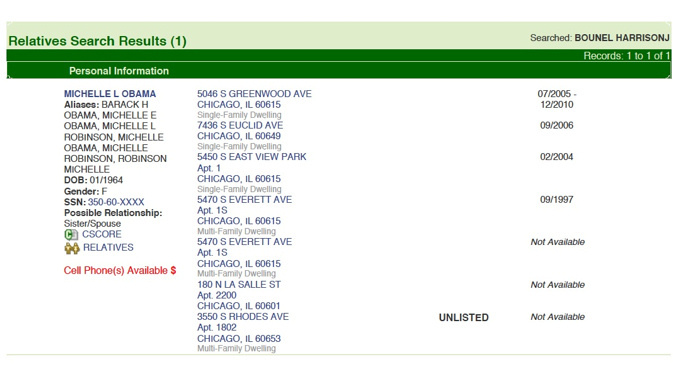 In this pull for SSN shows the last name of Bounel listed first and Obama’s is listed below. The same number was used to pull both names indicating that one SSN was being used by both individual identities. When the above PDF file is opened, pay close attention to the first page for it is the most important. The first image displays the date of 1890 which is the anomaly that opened the first investigation into the social security number that Obama stole in 1979 more than likely with the assistance of his loving family no doubt. This was a SSN verification that was completed in 2008 using Obama’s name associated with the stolen 042-68-4425 with his name listed as the owner. The result came back as a failure because naturally his name was never legally associated with that number. My friend Linda Jordan completed an E-Verify form and the results were as expected. What was searched was Obama’s name again associated with the stolen 042-68-4425 SSN and the results were labelled a Mismatch as shown below. This next image shows Michele Obama as Harrison J Bounel’s spouse. WHY? What was she doing that because she had to list herself as the spouse of Harrison J Bounel? Could she have been needing to access certain files that Obama was trying to conceal nad/or delete and so she had to list herself as his spouse because she was using his stolen SSN to obtain access to a particular file so it could be deleted or altered? The image below will describe what was just listed above. The following image is of the letter that Leslie received back from the SSA pertaining to her specific FOIA request for Harry Bounel’s SSN verification for the SSN of 042-68-4425. Now, bear in mind that if he were still alive Harry Bounel would be well over 120 years old. There is one Numident record for each SSN ever assigned. A numident is the social security number itself. It, the number is only assigned once and is never used again unless it is stolen. Leslie received this letter in response to her specific search of Harry Bounel’s record using the SSN 042-64-4425 and the letter which she received was a letter protecting the information for a 120 year old man who is long since dead. 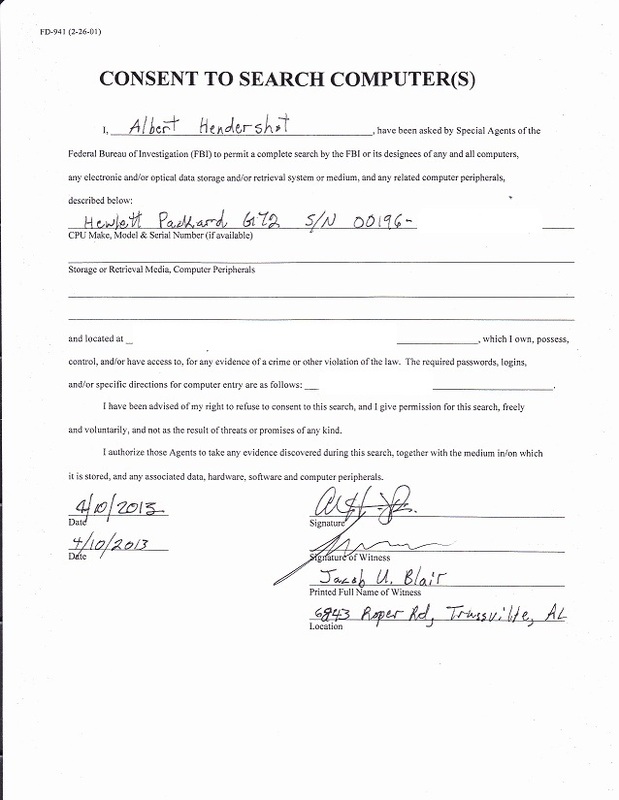 “They acknowledged my request for THAT numident and denied my request. In other words, that record exists and since there is only one Numident per SS# and that Numident for Harry Bounel with SS# 042-68-4425 apparently exists, then its not possible that O is using that number legally and it is apparent that Bounel is the original holder of that number.” As stated by Leslie Bishop. The Obama Hustle also defies anyone to disprove these findings as stated within this article. 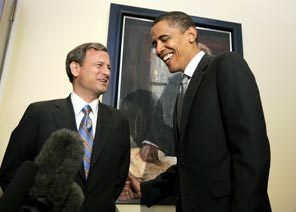 Chief Justice of the Supreme Court of the United States John Roberts scheduled a case by attorney Orly Taitz dealing with Barack Hussein Obama’s use of forged IDs to be heard in conference before the full Supreme Court. 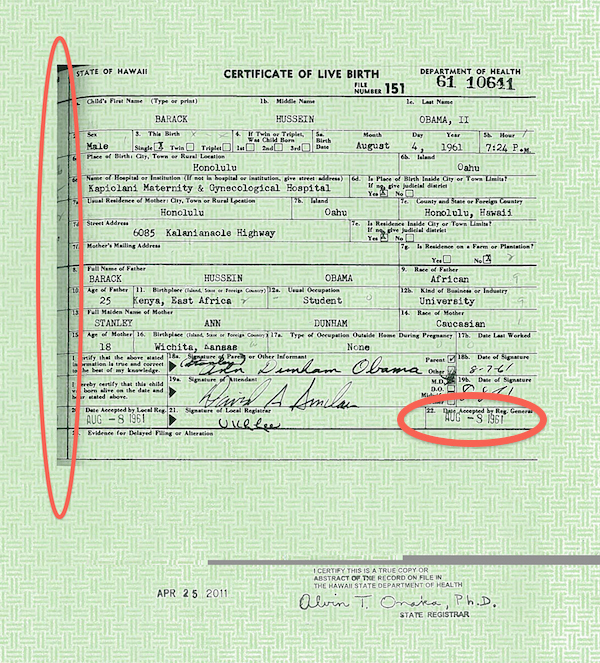 The case titled Noonan, Judd, MacLeran, Taitz v Bowen provides a mountain of evidence of Barack Obama using a last name not legally his, forged Selective Service application, forged long form and short form birth certificate and a Connecticut Social Security number 042-68-4425 which was never assigned to him according to E-Verify and SSNVS. Additionally, this case provides evidence of around one and a half million invalid voter registrations in the state of California alone. Please, keep in mind, Richard Nixon was reelected and sworn in, but later was forced to resign as a result of Watergate. over 30 high ranking officials of Nixon administration including Attorney General of the United States and White House Counsel were indicted, convicted and went to prison. ObamaForgery gate is a hundred times bigger then Watergate. More corrupt high ranking officials, US Attorneys, AGs and judges were complicit, committed high treason by allowing a citizen of Indonesia and possibly still a citizen of Kenya Barack Hussein Obama, aka Barack (Barry) Soebarkah, aka Barack (Barry) Soetoro to usurp the U.S. Presidency by use of forged IDs and a stolen Social security number. Dec 11 2012 Application (12A606) for a stay, submitted to Justice Kennedy. Dec 13 2012 Application (12A606) denied by Justice Kennedy. Dec 26 2012 Application (12A606) refiled and submitted to The Chief Justice. Jan 9 2013 DISTRIBUTED for Conference of February 15, 2013. 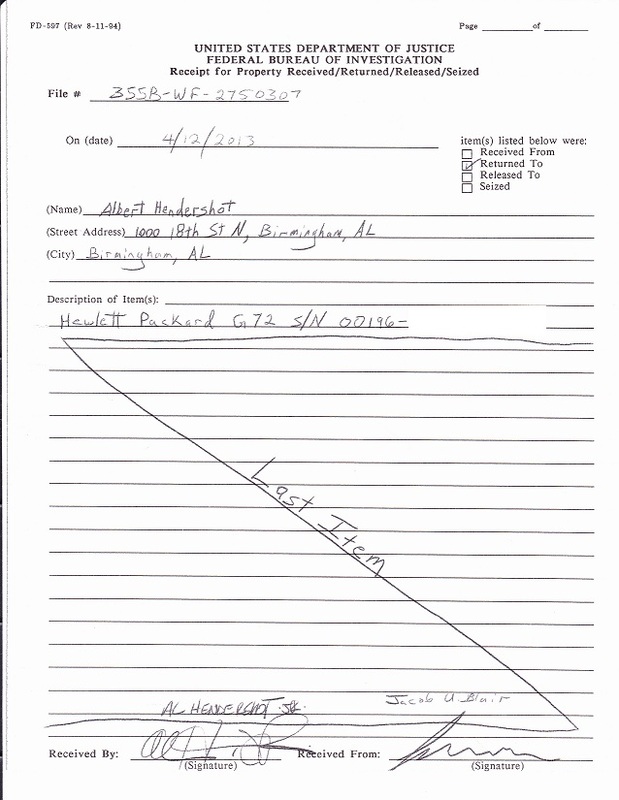 Jan 9 2013 Application (12A606) referred to the Court. Party name: Edward Noonan, et al.